Dotdot is the universal language of the Internet of Things, making it possible for smart objects to work together on any network. It represents the next chapter in the Zigbee Alliance’s continued commitment to create and evolve open standards for the smart networks in our homes, businesses and neighborhoods. Most IoT devices don’t speak the same language even if they use the same wireless technology, so Today’s Zigbee devices speak a common language with Dotdot, that language – the application layer at the heart of Zigbee technology – can be applied across other IoT networks. Dotdot has been developed by the Zigbee Alliance — an open, global, non-profit organization. In the Internet of Things, every smart device must understand and speak the same language at the application layer. How else is a smart hub expected to know how to communicate and control an off-the-shelf door lock or thermostat? Without a common application layer, devices from different networks (Wi-Fi, Thread, Bluetooth, Zigbee) can’t communicate. 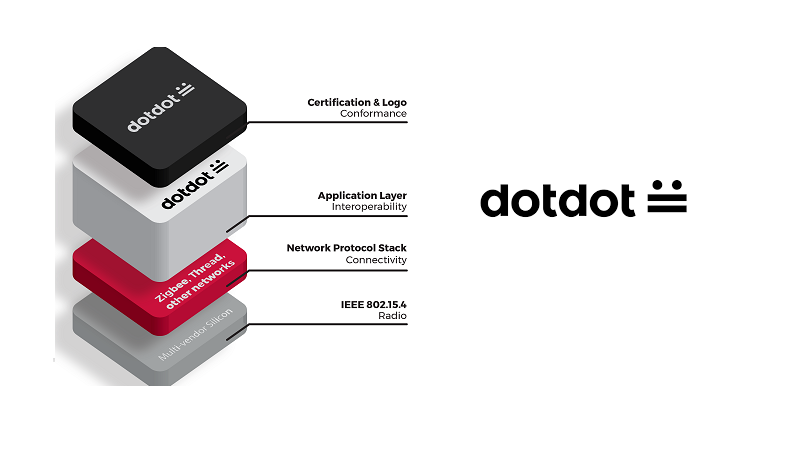 Dotdot is an open standard that can run over many networks allowing smart objects to communicate. Dotdot is based on the mature, proven solutions of the Zigbee Alliance. It is the product of 10+ years of work and experience from hundreds of innovative Zigbee Alliance member companies from across the industry and around the world. The Zigbee Alliance and Thread Group together bring you the availability of the Dotdot specification over Thread’s IP network. This is the first time developers can confidently use an established, open, and interoperable IoT language over an IP network, which will help unify the fragmented connected device industry and unlock new markets.